There was once a new Whaler named Nantucket. No New England rock coulda' sunk it. From the Sea Ray Boat Group--who'da thunk it! 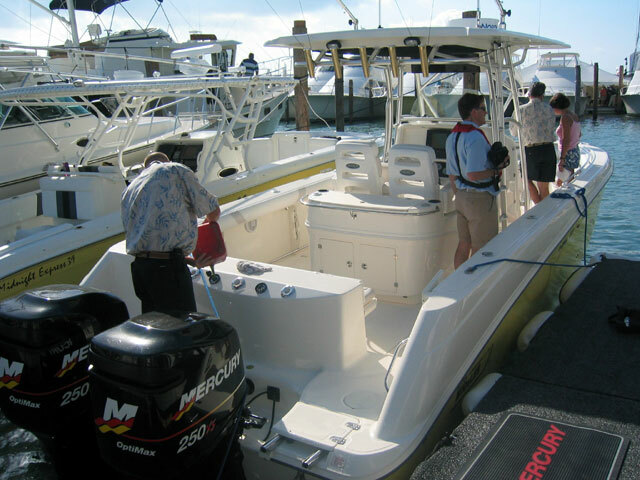 The Boston Whaler company caught everyone off guard with the introduction of a new model at the 2003 Miami Boat Show. With strong retro-styling and many historical touches, our favorite boat builder introduced the 190-NANTUCKET. This boat fits into the same size niche as the classic 18-OUTRAGE. My sincere thanks to Allan Rossmore for sending these fine digital photographs. We'll add more information and more images to this article in a day or two, as time permits. copper wiring, heavy duty rub rail. with jack, tie downs and winch with nylon strap. 10-year transferable limited hull warranty. 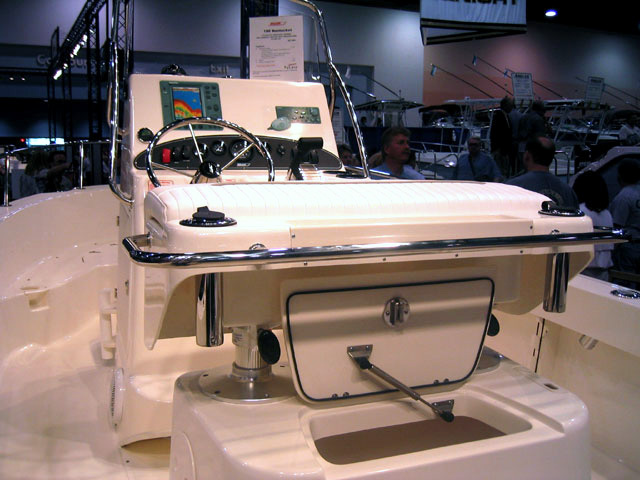 pedestal seats at helm; 15-gallon live well. four-stroke, 135-HP Optimax, and 150-HP Optimax. This Press Release contains additional details about the planning that went into the design of this boat. 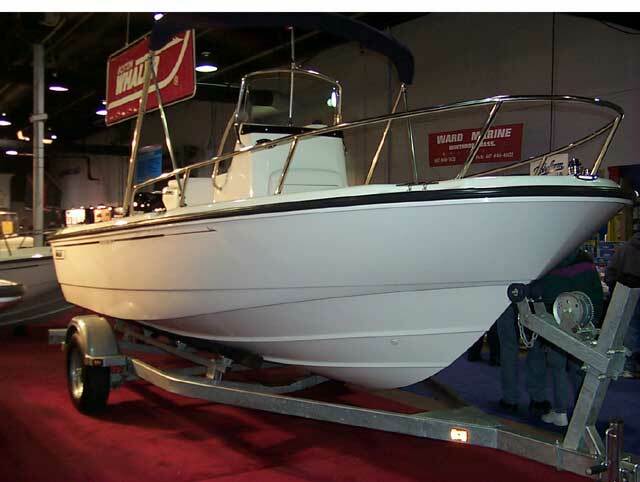 With no advance warning, Boston Whaler revealed their latest model, the 190-NANTUCKET. Even the model name is evocative of Whaler's legendary past. Details like this bow chock and running light fixture echo the classic styling of Whalers from decades earlier. Maybe someone is listening in Edgewater! The top of the console features a nice flat surface. Compared to the crazy curves on the 210-OUTRAGE, this console makes much more sense. The SONAR and RADIO are just cutouts pasted in place for show; they're not real electronics. This view makes the stern seats look differently sized, but I think they're the same width. The 115-HP engine is the minimum rated power for this hull. 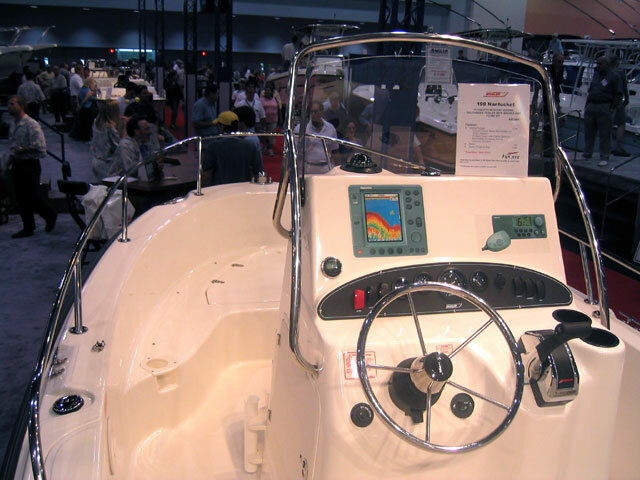 To keep boat show prices low, boats are often shown with the least expensive engine. Considering the hull weight of this boat (2,050 pounds) the maximum rated 150-HP motor seems like the only real option for power. Please note that there is no Euro-style transom. The stern of the boat seems modeled more like the popular 170-MONTAUK, with a slight rounding at the corner. 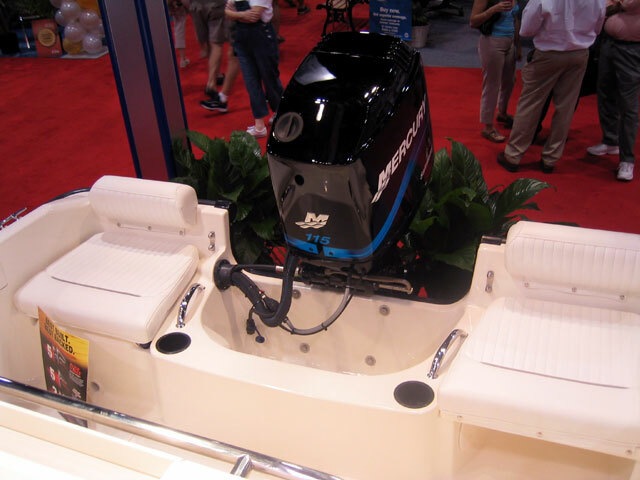 Fishermen will have to mount their trolling motor auxillary engines on a bracket, as the narrow transom notch leaves room for only a single engine. The bow locker compartment is divided into two sections. You can keep the anchor and rode in the larger one. The other side looks like it could accommodate a few cold beers. 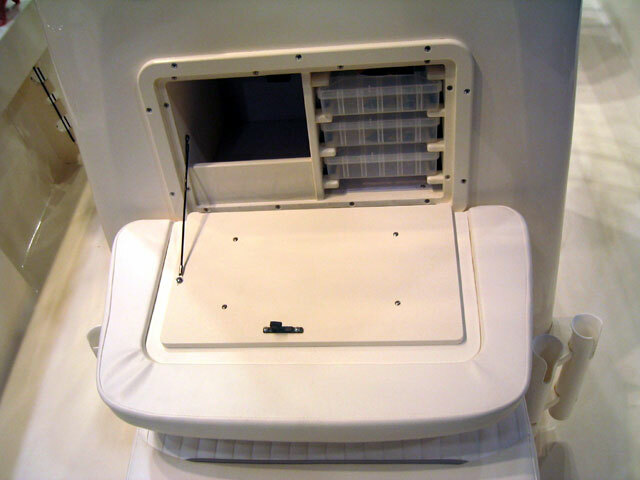 This optional tackle drawer is built into the forward bulkhead of the console and is part of the fishing package. I like the detail where the seat back is snapped to the drawer cover so that you can get to the tackle without removing the cushion. What keeps it closed in rough seas? The standard helm seat is a leaning post mounted to a molded base that contain a bait well. The base is designed to also accommodate two optional swivel pedestal seats. On the optional baitwell there is a rubber gasket seal and a strong hold down latch to keep the lid securely closed in rough seas. This is a nice detail, and one that keeps those expensive bait fish from ending up all over the cockpit. The height of the gunwales (22-inches) looks somewhat lower than has been the trend lately. This boat has midship cleats that angle slightly outward. I miss the stern hawsepipes leading to cleats mounted under the gunwales, a detail that was more or less a trademark of a Boston Whaler Outrage. What is that doo-dad on the console? Any guesses? [Turns out it is a horn.] The optional sun top fastens to the hardware seen here on the gunwale. 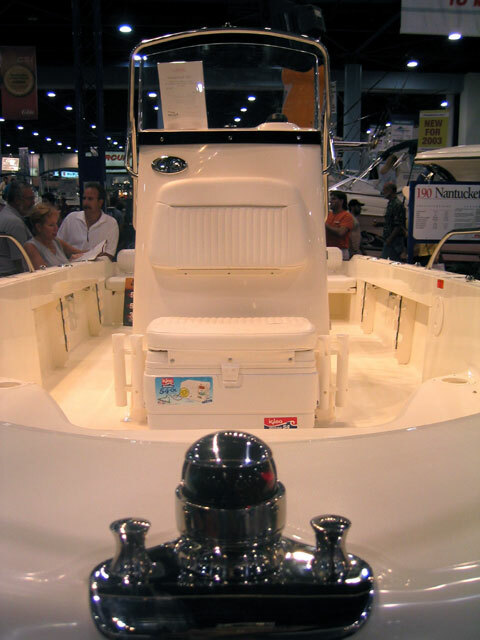 About two days after the debut in Miami, the Boston Boat Show opened its doors and Whaler had the 190-NANTUCKET on display there, too.Brian Nunes-Vais was in attendance and also sent in some nice pictures of the new boat. The factory had enough of these new models already made to get one up to Boston in time for their show, which ran almost concurrent with the Miami event. This bow quarter view gives a good impression of the boat's size and lines. This boat has the sun top option. It looks like it can be stowed in the up position and tilted forward. 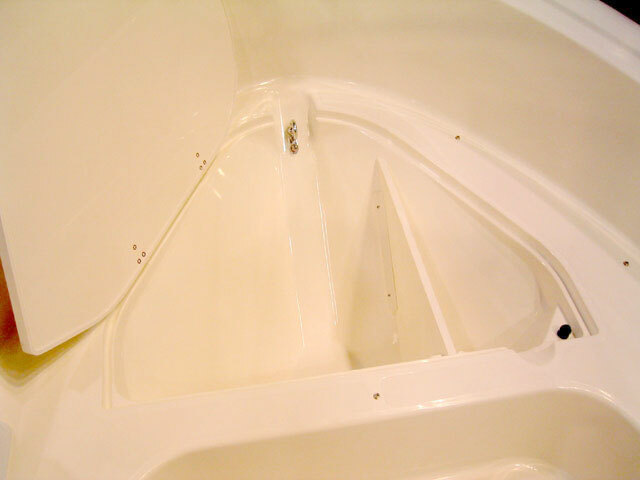 The deep vee of the bow moderates as it goes aft, turning into this somewhat rounded bottom at the transom. There are four strakes running aft all the way from bow to stern. I count five drains on the transom. My guess is the three larger ones drain the cockpit and perhaps a rear locker; the smaller drain the splash well and perhaps a pump discharge. There must be some plumbing under those seats and in the bilge space around the engine splash well. 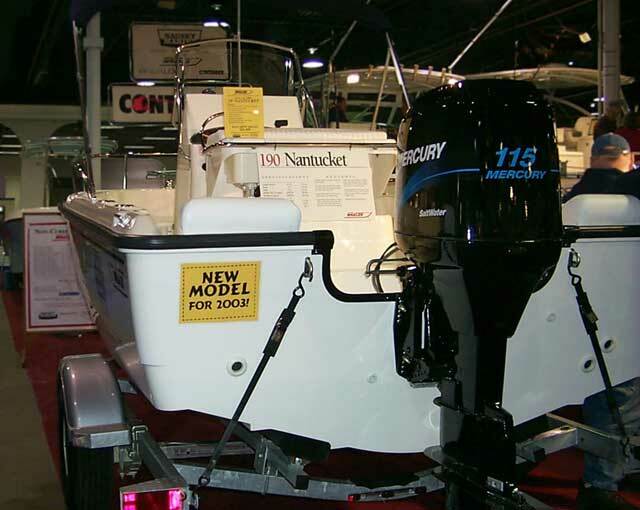 While the new NANTUCKET was the big surprise, Whaler also showed some new details in several other models. They've built at least two of the new $150,000 320-Outrage models. 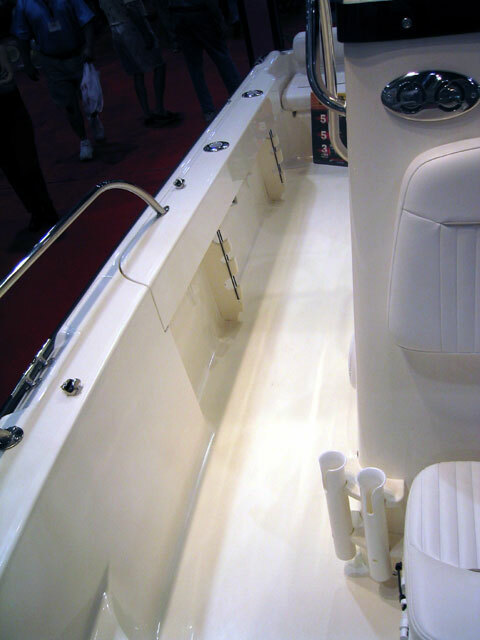 The one in the water and available for test rides at the Miami Boat Show had this yellow hull gel coat. Notice the color of the hull on the adjacent Midnight Express 39. A coincidence? 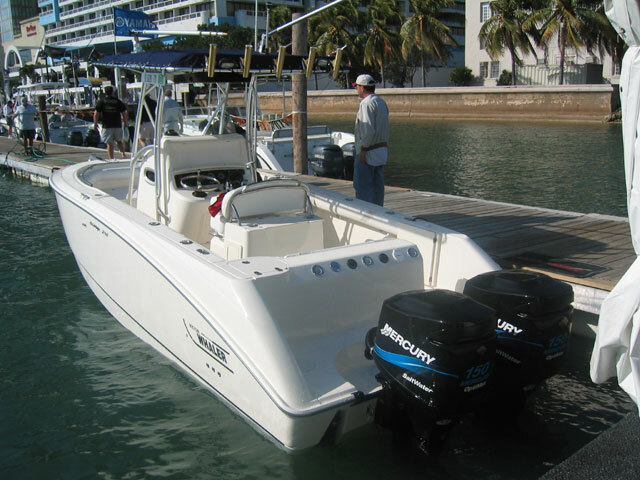 With twin 250-HP Optimax Mercury "Racing" 2-strokes on the transom, it is no wonder you have to add some fuel and oil on occasion. (Also see our feature on this model in Cetacea Page 69). 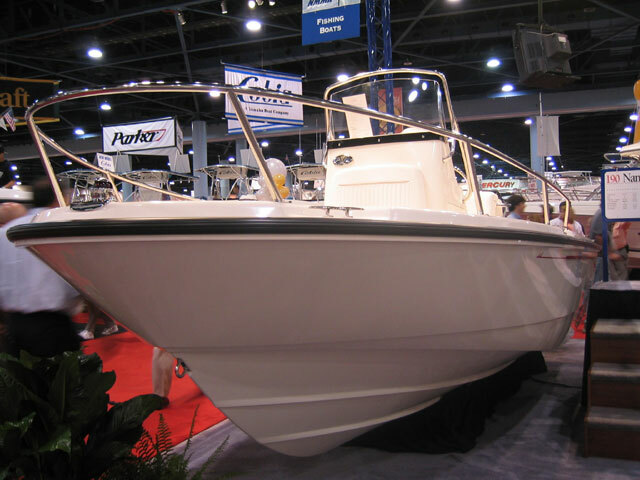 The smaller 240-Outrage has hull lines that are similar to the 320 model, although perhaps not quite as nice when in the smaller scale of a 24-foot boat. This hull was in-water at the show, but I don't know if you could go out for a spin. The page has been accessed 61874 times. This article first appeared February 16, 2003.